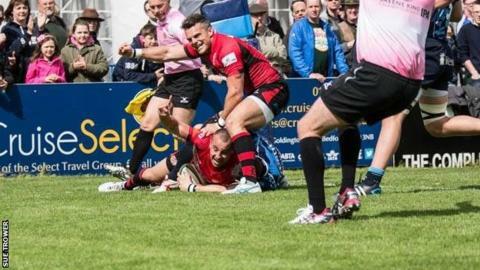 Jersey captain Alex Rae says they must take steps to strengthen for next term after securing their RFU Championship status on the final day of the season. coupled with defeat for Ealing, ensured a third season in English rugby's second tier. Jersey ended the season one point ahead of Ealing, who were relegated. "There were a few tense moments out there but I'm just so happy to come through it," Rae told BBC Radio Jersey. "It meant so much to everyone, we've put so much effort in. "We're such a hard-working group of boys, I know it doesn't always come off on a Saturday, but we haven't questioned the work-rate and the desire of these lads, it's massive."